CHICAGO (AP) — About a year and half ago, my dad and I began running races together. It started because I had hit a running drought. After years of running every day, my drive had waned. Running was getting boring, repetitive, so I took a break. After a while, though, I missed how good it made me feel, and I signed up for a 10K to force myself back into it. I asked my dad, an avid runner, if he wanted to join me. I didn’t know this would spark a new hobby for the two of us. I didn’t know it would lead to dozens of hours striding beside one another and talking. I didn’t know how the desire to keep running races with him would motivate me to keep running. I wasn’t always a runner. Until college, I had never even run a mile without stopping. But to lose weight junior year, I began dragging my sluggish body to the treadmill every day, loathing the experience until, much to my surprise, I stopped feeling out of breath. As I got in shape, it started to feel good. I began running longer and faster until I was going 6 miles daily. Even before that, however, running had long been a way for me to bond with my dad. He has been running for as long as I can remember. On weekends when we were small, he’d take my siblings and me with him in “the cart” as we called it, pushing us along as we all sang songs. 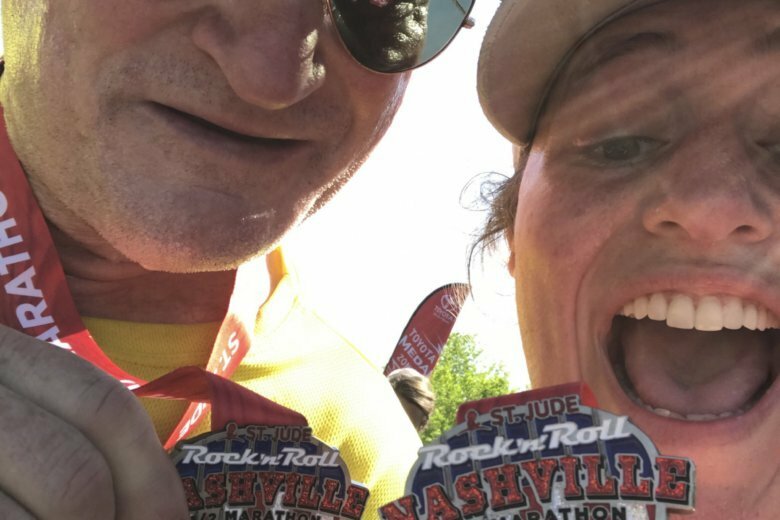 When I finally became a runner in my own right, my dad was thrilled to swap tips and stories. He was running 8 miles a day by then (and still is) and we began to chat regularly about the merits of various routes, the best post-run snacks and the best ways to distract yourself when tired. When I asked him to run that first 10K with me, he was hesitant. A 10K (6.2 miles) can be a waste of time for someone who runs 8 miles every day. Still, he said yes, not wanting to pass up time spent with one of his kids. We had the time of our lives. My mom met us at the finish line and took our picture as we crossed. She told me that for the rest of the day, my dad couldn’t stop talking about how much fun he had. He began emailing me links to more runs in Chicago, asking me to sign us up. As I got stronger, we signed up for longer races. Often they became family affairs, with my mom meeting us for pictures, and my brother and sister meeting us for celebratory brunch. It was the middle of winter when I decided I was ready for my first half-marathon. My dad did not hesitate to join me. We layered and layered and ran 13.1 miles in the Polar Dash. It was 1 degree Fahrenheit. The air was thin, and I hadn’t trained as much as I should have. By the end I was running slower than a 12-minute mile. My dad didn’t care. No matter how slow I go, he always matches my pace. He’d rather spend the time with me. He’d rather cross the finish line together. My dad is a lawyer and travels every week. He spends so much time on the phone that, growing up, my friends theorized he must really be a secret agent. On our runs, though, he almost never picks up a call. My dad is also a quirky guy, but his quirks stem from his immense determination and drive. He wholeheartedly believes pain is in the mind. He is so dedicated to running that he will run 8 miles inside an airport during a layover if that’s the only time he has. He will run back and forth inside a hotel room until it equals 8 miles. We make fun of him for this, but I admire the way he can be so dedicated to something that, no matter what, he will find a way to do it. I don’t have quite the stamina he does, but like him, when I have committed to something, nothing will stop me. I’m proud to say I get that from my dad. And I’m so happy this shared determination has given us so many hours together — that well into adulthood, I have something so special to share with my dad.